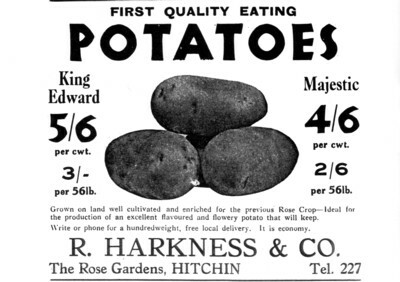 From an article in Old Hitchin Life, Hitchin Historical Society’s original journal, we discover that potatoes were available from rose-grower R Harkness & Co in 1940. Peter Harkness M.A., then managing director of the company, tells us that Bill Harkness, his grandfather and a champion rose grower, had to learn to grow prize onions, potatoes, carrots and brussels sprouts during the war years. Sadly, the bumper crop of roses ready for sale in 1939 was mostly burnt to make way for the vegetables “thanks to Hitler”, he writes, but with “a precious nucleus being retained against happier times”.